“This one is called The U-boat; the oldest building in the complex. Prisoners were crammed 12 men to each windowless cell and the lights were never turned off. The lucky ones had a bucket” recounts our guide, a good-humoured if distant lady of indeterminate age. The group she’s leading is also 12 strong, and we’re uncomfortably close to each other in the tiny room behind a formidable wood and steel door. Like all of the guides at Hohenshönhausen, Siggi Grünewald is am ex-inmate. Her story unfolds in parallel to that of the former institution we’ve paid to visit: a resident of East Berlin she helped a friend with plans to escape the German Democratic Republic, only to find that the whole episode was organised by the Stasi, the communist secret police. She was sentenced on grounds of “anti-state trafficking” in 1981 and released in 1982 as part of ‘Häftlingsfreikauf’ – an amnesty whereby hundreds of similarly imprisoned individuals were gradually released into the West in exchange for foreign aid. Some people believe that the DDR only functioned in its final years by exchanging prisoners for cash, but it’s without irony that Frau Grünewald now works at the facility which cost so many people their freedom and dignity. After acquainting us with the U-boat our guide tells us more about this sinister complex. The walls and guard towers weren’t strictly necessary as regular citizens would never know of let alone approach Hohenshönhausen. It wasn’t on any maps. Surrounding houses would only be assigned to party officials, cause-serving automatons who could be trusted not to think. 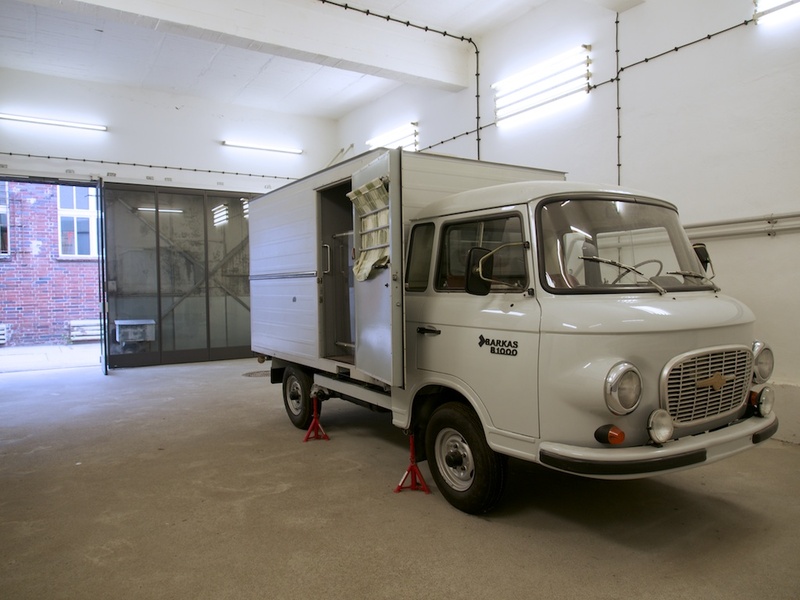 Although there was a hospital on site, prisoners would be bundled into the back of a van and driven around Berlin for a couple of hours before being delivered to a ward. We’re looking at such a van now as our guide begins the tour proper by recounting the key events from a prisoner’s perspective. ‘A’ is for abduction, the last fleeting moments of freedom ending with a sudden bag over the head followed by detention in a specially adapted van, usually disguised as some kind of grocery delivery truck. The example above features 5 individual cells. 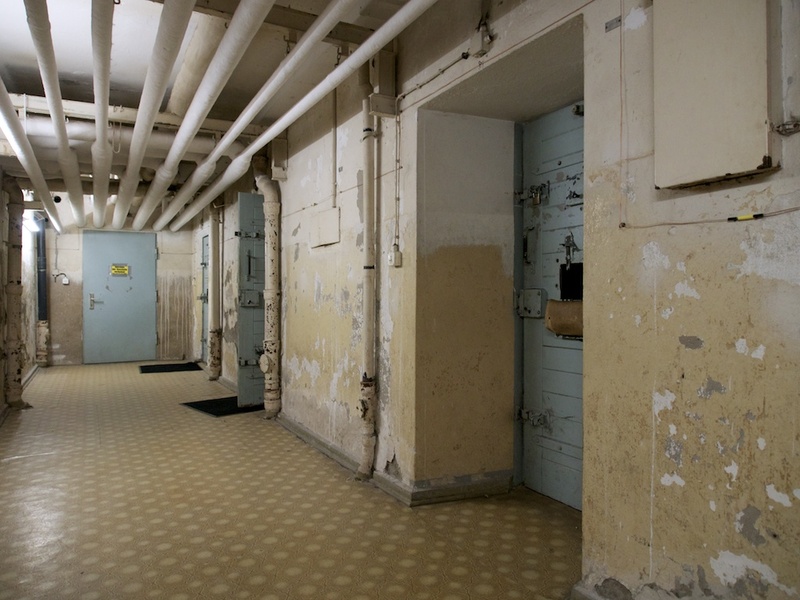 Following capture and transportation to Hohenshönhausen, prisoners would be reclothed and presented for interrogation in an empty room, separated from the interviewer in another chamber by a barred hatchway. When the facility was closed at the end of the cold war, investigation of cases of leukaemia among former inmates led to the discovery of experimental X-ray equipment in this room. Communication among inmates was non-existent once the U-Boat evolved into the modern facility shown in these images. Each prisoner would be assigned one carer, who would communicate primarily via three commands: come, go, stand. Whenever prisoners were to leave their solitary cells they would be accompanied and marshalled using these commands. A traffic-light system operated within corridors to prevent one prisoner having contact with another. In the event of two prisoners having to pass, one would be made to face the wall until the other had vanished. By now the mood within our tour group is sombre, but Siggi Grünewald picks us up by recalling how male and female prisoners alike would often be overtly observed while changing into their bedclothes at designated times, and the difficulty she experienced trying to adhere to the authorised sleeping position: on your back, hands unfolded across your abdomen. I’ve no idea why this would cheer anybody, but on a personal level we 12 now feel closer than we did in the cold cellars of the U-Boat below. This article is dedicated to my grandfather, who was taken to Hohenshönhausen in 1960 after being reported by one of his colleagues for criticising the state. Today would have been his 87th birthday.